The symposium seemed to lean more on the business and legal side of things rather than the policy and science side, so I was out of my element, but I’ll try to write about some of the interesting things I learned there. USD also publishes the San Diego Journal of Climate & Energy Law, if you’d like to read more about related topics. These were common themes throughout the day, especially the growth of solar and the proliferation of distributed energy resources. 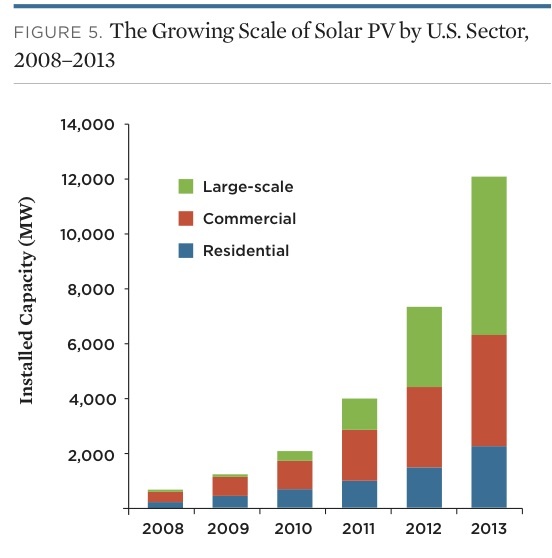 Although Sky Stanfield (at Keyes, Fox, & Wiedman LLP) stated that the increasing number of grid-connected solar installations has been mostly in the residential sector, as you can see from this recent report by the Union of Concerned Scientists, solar PV is growing exponentially in residential as well as commercial and large-scale sectors in the US. Of course, some countries, such as Germany, have surpassed these levels. Germany now generates as much as ~30% of its electricity from renewables, mostly from solar and wind power. The government’s goal is to double that amount by 2035, and they’re on track to successfully do so. However, in the meantime, they need to address issues of adapting the electrical grid and constructing new grid-storage capacity—issues also faced by the US electric industry. 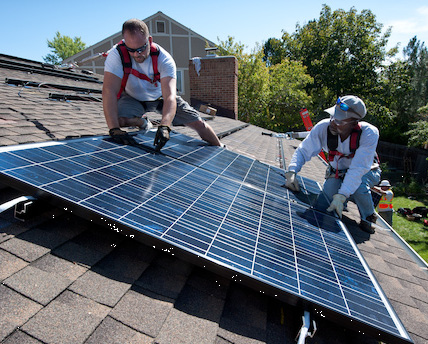 Distributed energy, such as with rooftop solar panels, has the potential to allow individuals and communities to have more power (no pun intended) and influence with respect to utilities. Distributed generation could not just decentralize but also even democratize electricity systems, although that seems a little overoptimistic to me (see this article in Grist). Some states have witnessed opposition to distributed generation and to “net metering,” in which an electricity consumer who generates on-site electric energy (such as with solar panels) can offset part of their electricity bill. Some people have portrayed that as “free riding,” and Troy Rule (Arizona State Law School) showed this anti-net metering advert, which is ridiculous and funny as propaganda. So what’s next? Kevin Jones (Vermont Law School) talked about five environmental pathways for an improved electric grid in his book, “A Smarter, Greener Grid,” including things like distributed energy technologies and optimization, electric vehicles, and areas to improve energy efficiency. Dian Grueneich, a former Public Utilities Commissioner, outlined proposals for “California’s Electricity Policy Future: Beyond 2020.” This included updated net-metering policies so that individuals and communities could more easily share a solar project’s electricity output. More importantly, she argued for a inter-agency policymaking structure that integrates electricity with climate, water, air quality, and transportation goals. For all their talk of “innovation” (or even “disruptive innovation”! ), I can’t say I left feeling like these people are transforming the electric industry in a fundamental way; they’re just gradually adapting to worsening climate change, which means more people with solar panels and making grids less vulnerable to Sandy-like storms. They’ll have to adapt to much more than that, judging from the conclusions of the newest IPCC report. But what do Californians, industries, and policy-makers really need to do to mitigate, and not just adapt to, climate change? The symposium, which included speakers from and was sponsored by San Diego Gas & Electric, made inroads but only touched the surface of this question. The final person to ask a question during the final Q&A period referred to this issue, but her question remained unanswered and was postponed to the reception, where alcohol would be served.